When I first saw this story, all the information given was that on this day in 1950, seven men had taken $1.2 million in cash and $1.5 million in checks and money orders from a garage in Boston. Which doesn’t do anything to explain why a garage had almost three million dollars on hand. This becomes clearer with the information that the Brinks garage was a depot for armored cars and that the masked men raided not the garage but the adjoining Brinks building where the contents of these armored cars was sorted and stored. In advance of the theft, the team of eleven, let by Tony (the Pig) Pino, had surveyed the building from adjoining rooftops. Every single man had been inside to scout the premises. They removed five lock cylinders, one at a time, and took them to a key shop after hours to get keys for the building. Their thoroughness meant that they could detect the activity going on inside from the patterns of lit windows. They held rehearsals and ultimately a half dozen attempts before their final foray on the building. 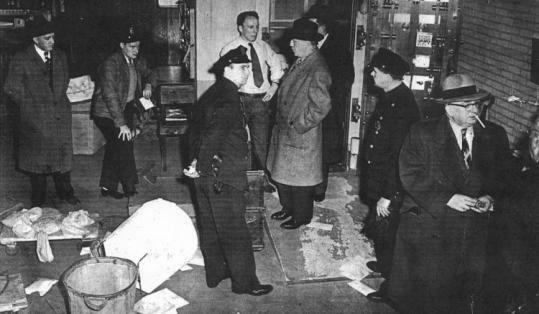 The group pulled off the largest robbery in US history to that date. They left with sacks of cash and checks weighing over half a ton. Some of that money would be recovered. The trail of a $10 bill thought to be counterfeit was traced by the FBI from a Maryland amusement park to a picnic cooler in a hole behind a wall panel in a downtown Boston office containing over $50,000. Meanwhile, the participants in the Brinks robbery had begun fighting amongst themselves. Several attempts were made on the life of one of the outfit, Joseph ”Specs” O’Keefe, including a gun emptied upon his car and an attempt by hit-man Elmer ‘Trigger’ Burke that left O’Keefe with a bullet in the chest. Eventually, approached in his hospital room by the FBI, he agreed to testify against his colleagues. The entire gang was taken with days to go before their case would have to have been dismissed under the statute of limitations. This entry was posted in Boston, Old News and tagged Crime, Downtown, FBI, Great Brink's Robbery. Bookmark the permalink.